Edward Noel Mellish was born on 24 December 1880 at Oakleigh Park, Barnet, North London. He was the son of Edward and Mary Mellish. He went on to be educated at Saffron Walden Grammar School and from there became a member of the Artists Rifles. In 1900 he began serving with Baden-Powell's police against the Boers in South Africa. On the outbreak of the First World War he offered his services to the chaplaincy and served from May 1915 until February 1919. Just a few months after this his brother Second Lieutenant Richard Coppin Mellish was killed in action whilst serving with the 1st Middlesex Regiment at the Battle of Loos on 25 September 1915. Reverend Edward Noel Mellish was attached to the 4th Battalion of the Royal Fusiliers in Ypres Salient in 1916 and it was them during the first three days of the "Action of the St Eloi Craters" that he performed the action for which he was awarded the Victoria Cross. 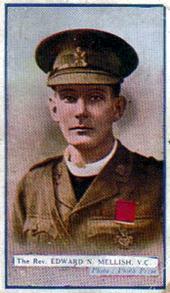 He was the first member of the army chaplaincy to win the VC. St. Eloi is located approximately three kilometers east of Ypres, Belgium. The defense of St. Eloi is commemorated by the Hill 62 Memorial. Replica medals are on display at The Museum of Army Chaplaincy. reporting Noel Mellish's VC award. That was remiss of me to get the wrong photo. My apologies..and correct photo now in place. Thanks for your observation.